(1) Extended fault detection and protection. Customers can read the error code in Palnel also. (8) A 4pin connector to RS232 cable allows for configuration. (14) Configurable 12V brake signal input, in lieu of motor temperature sensor. Brake switch and motor temperature sensor used the same pin on pin1.Sorry,you may not want to use both functions at the same time. (18) Enhanced regen brake function. A novel ABS technique provides powerful and smooth regen.The regen can happen at any speeds until zero speed. (19) SCLS-D controller included the fuse and shunt on the case. Caution! The regen is not a safe function.Usually you may use the mechanical brake. •Motor Current Limit, 10 seconds boost: 400A ,depending on the model. 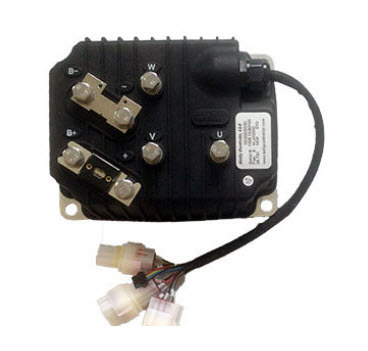 •Motor Current Limit, continuous: 160A ,depending on the model.